In Chania, there are several beaches with crystal clear waters, which are visited not only locals but also tourists. Apart from the classic beaches and visit all know, there are other less known, which remind us that there will always be new places to discover. Beaches where there is a lot of people and we will enjoy a swim calmly, watching the landscape, reminiscent of exotic island with nothing to envy from the Caribbean and Bali. Access to the beach is a bit tedious because you have to drive in a bad dirt road length 23 km (45) from the village Rodopou. However, the road comes close enough to the beach, but is not recommended for low cars. Also, trips performed by boats from the port of Platanias on Menies. Also, on the steep coast between Menies and Fluffy formed many beaches that are accessible mainly by boat. The bus that connects Chania with the Cross passes from Tersanas and Maherida. The coastline near the beach is a unique habitat, as here find shelter many wild animals. Indeed, among the rocks, is an impressive karstic doline (crater) where gushing springs with brackish water in which living water snakes, turtles and Psaropoula. The AFRATA is a small village, 3.5 km north of Kolymbari and 28km west of Chania at Cape Rodopou. 1 km east of the village is the beautiful beach, well protected in a calm bay. The beach is pebbly and beautifully colored waters. It is mainly a selection of local residents, and not affected by the wind. The wild environment of Cape Rodopou, combined with the tranquil scenery of the sea and the picturesque village, make the choice Afrata ideal. There are umbrellas, small trees and two canteens that will provide you the necessary. The road from Kolimbari is paved, but caution is needed because it is narrow. After the village, follow the road to the beach, which passes through a beautiful gorge with numerous herbs and ends in a small bay. 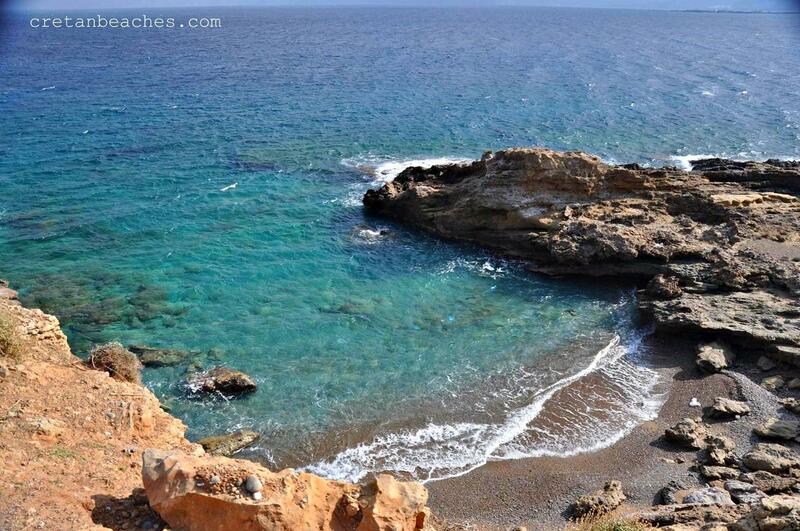 The beach Ravdoucha located about 21 km west of Chania, near the village on the peninsula of Rodopou. The landscape around is beautiful, with high mountains, wild rocks and old olive groves. The village is built on top of a wooded hill with breathtaking views of Kissamos Bay. The area has many small bays with pebbles and beautiful formations of rocks. The sea is often affected by the wind and is ideal for snorkeling. Also in Ravdoucha there are few, but good fish restaurants and little tourist infrastructure. There are umbrellas, but you can find shade under the trees on the beach. Access to Ravdoucha is by car, along a short road from the national road Chania – Kissamos. 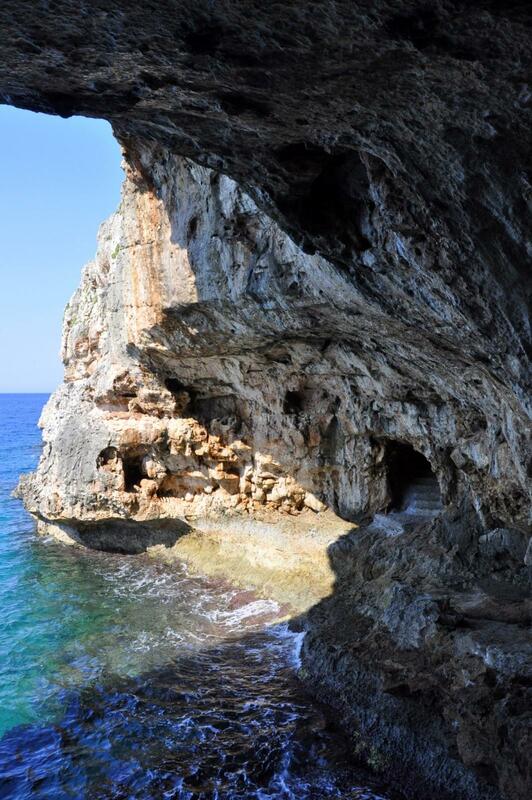 On the way to the beach you will find the beautiful cavernous temple of Saint Onoufriou. Lake of Aries or Viena is located 10km west of Paleochora and 90km south of Chania. Next to the beach passes the E4 path that connects Paleohora to Elafonisi. The beach is mostly rocky and sandy in some places. It is protected by a large number of rocks, forming a small lake. There are no facilities in the area, and close to the beach there is plenty of vegetation, where you can find shade. 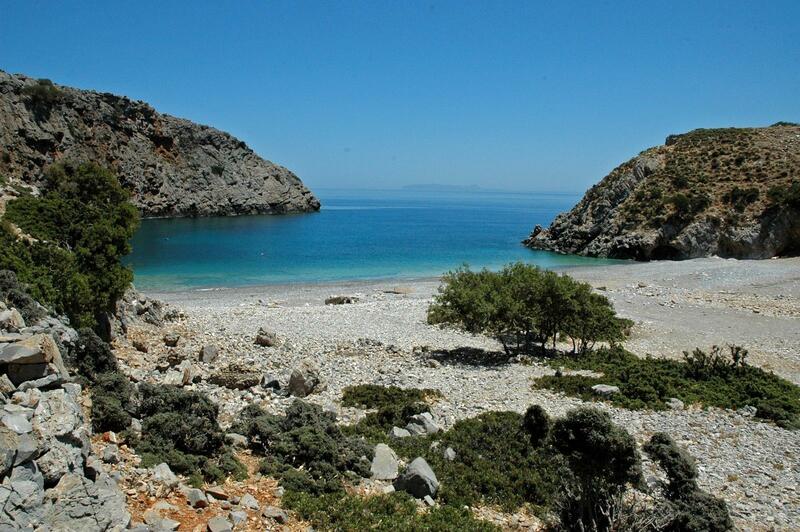 Access by land is not easy, which makes Lake Aries one of the most unknown and secluded beaches in Crete. Access to the beach is not difficult, and from here passes the E4 path. If you have a car, you can take the road that leads west from Paleochora to the Krios beach. Before you reach the end of the road, you will find a canteen in the central beach of Aries. Turn right on the dirt road just before the canteen. Follow the road that substantially surrounds the hill west of Aries until you reach a church on your right. Continue to drive left until you encounter a deadlock. Leave your car there and walk to the beach for 10 minutes, crossing the small forest. The OBROSGIALOS Gialos is located 26 km east of Chania, on the east coast of Cape Drill, near Kefalas and Paleloni villages. It is a rocky beach with beautiful blue deep water. On the beach there is a small port with a jetty, from which usually dive in the crystal waters. The beach is not organized and far from accommodation. The sea around the Obrosgialos is ideal for mask. Accessible by car, along the asphalt road that starts from Paleloni. Another access way is to come by boat from a nearby port, eg Georgioupolis. The Lissos beach is located in Saint-Kyrkos location (Agios Kirykos) about 71km south of Chania and 3 km west of Sougia, in a verdant valley. Lissos is the site of ancient Lissos, which was the seaport city Elyros, ruins of which are preserved in the village Rodovani. The beach is deserted, completely disorganized, with pebbles and open to the south winds. Next to the beach there are several trees that provide shade to the swimmers. 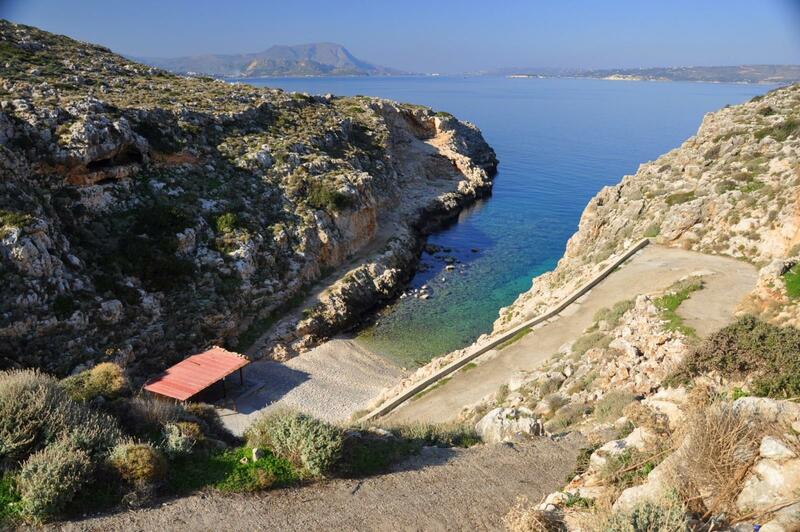 Access to the beach of Lissos is mainly by boat from Sougia (20 ‘) or hiking (90′-120’). The path from Sougia passes through ancient Lissos. Near the beach is the picturesque chapel of Agios Kirikos, which is celebrated on July 15. If you are in the area the day before, you can participate in the feast of St. Kirikos. Boats with pilgrims reach the beach, the world is headed to church, participate in the operation and then erected large feast. The beach spoon (ladle) is located 25km east of Chania, very close to the edge of Cape Drill and 1 km north of Red Village. The area is filled with fantastic caves such as the Cave of the Elephant or the Petsis Spilios. The beach is generally isolated and almost unknown to all. Formed at the exit of a rocky gorge and in the arms of an oblong bay. Pebbles and large stones, which are a little difficult swimming. You can combine your walk at Cape Drill with a swim at the beach. It is ideal for fishing and for isolation. Of course, you must take care to have with you all the necessities, such as umbrellas, food and water. To get here you need to follow the road leading north from the Red Village to the Nose of Akrotiri. From there follow the road to Faro and about 700m. north will see a sign for the beach through a dirt road. The car goes down to the beach. Next to the beach formed a large cave. It is located 8 km northwest of Kissamos and 44 km west of Chania, on the east side of Cape Gramvousa. It called so probably the name of someone who had a well here. there are three small consecutive bays, sheltered, with small pebbles and crystal clear deep waters. Next to the beaches there is no infrastructure. It is an ideal place to relax, away from the bustle of the city. On the beaches there are a few small trees, under which you can find shade. The beach directly behind the kiosk you pay ticket to Balos lagoon called mulberry Lakos. To get stou PIGADI, you have to walk or drive for 1.5 km in the road from Kaliviani and leads to the lagoon of Balos. If you visit the beaches, do not forget to have water with you. Next to the road that leads to the lagoon of Balos, about 4 km north of Kaliviani formed small bays Kakia Skala with steep cliffs. There is a point at which there is a sheltered cove, where formed a lovely small beach with pebbles and wonderful deep blue waters. Access to the beach is not easy, as the cliffs complicate the descent. 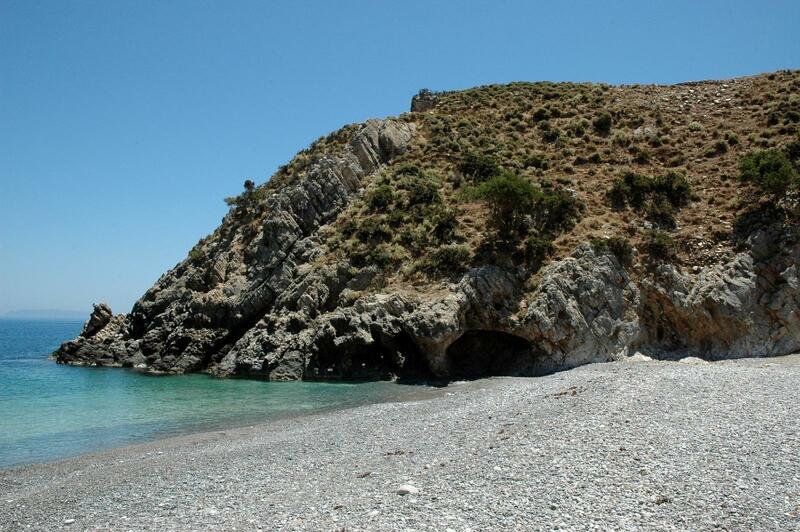 In the area between Ravdoucha and Nopigeia several bays with small beaches mainly pebble and rocky bottom. From Nopigeia the road runs along the coast through a spectacular seascape as Notre Myrtidiotissa Choni and stops a little further. From there we can walk as the restored chapel of St. Basil located on the beach. To get initial climb in very bad dirt road on foot and then walk down to the beach with the chapel located approximately in the middle. The beach has large pebbles and beautiful rocky bottom. North from Agios Vasilios beach formed a small stream where we can reach on foot from the Ravdoucha region. At the exit of the formed tiny pebbles of the Dark, the most beautiful “kavatzes” in western Crete.